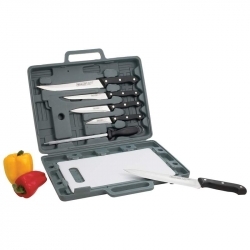 Be a chef-on-the-go with this complete knife set which includes: chef's knife, slicer, boning knife, utility knife, and paring knife; all are housed in a protective case with cutting board and sharpening steel. Polypropylene case measures 14-1/4' x 12-3/8' x 2'. Limited lifetime warranty. $49.00 Open Stock Value. Color insert. Royal Crest(TM) 6pc Non-Stick Coated Cutlery Set includes: 8" chef's knife, 8" carving knife, 8" bread knife, 5" utility knife, 3-1/2" paring knife, and Y-peeler. Features stainless steel blades and Leymar(TM) handles. Limited lifetime warranty. Gift boxed. 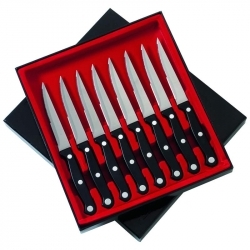 Whether you are slicing fruit or deboning a chicken, a high-quality knife set is a must for the kitchen. 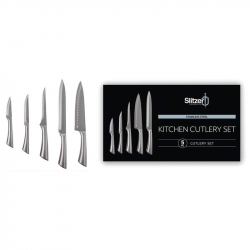 Our Slitzer(TM) 5 pc Ceramic Cutlery Set is a premium knife collection, yet easily affordable for the home cook. The ceramic coating is nonstick, durable, and easy to clean. 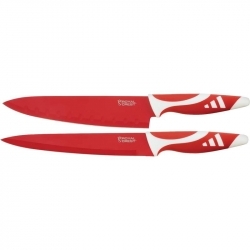 Red, soft touch handles are designed for ergonomic comfort. 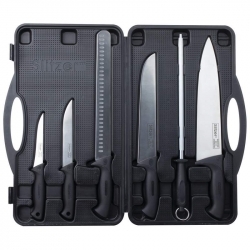 This Slitzer(TM) cutlery set is packaged in a magnetic color box for easy storage and protection of the cutlery set when not in use. 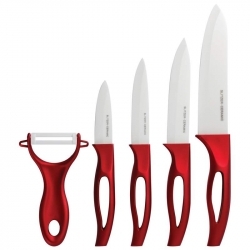 The 5 piece set includes a 6" Chef knife, 5" carving knife, 4" utility knife, 3" paring knife, and peeler. Limited lifetime warranty. High-performance yet beautiful on the table, the Maxam(R) 8pc 8-7/8" Steak Knife Set features dishwasher safe polypropylene handles feature a triple faux rivet design. Stunning gift presentation box. Limited lifetime warranty. Process and prep your favorite culinary delights with the Slitzer(TM) 10pc Professional Surgical Stainless Steel Cutlery Set. Superb stainless steel construction will last through years of use. 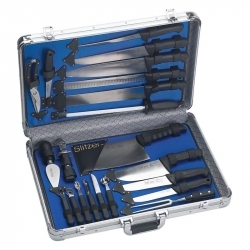 Includes Chef's knife, cleaver, bread knife, butcher knife, meat knife, utility knife, curved paring knife, meat fork, sharpening steel, and zippered canvas case. Case measures 17-3/4' x 9-7/8' x 2-1/4'. Limited lifetime warranty. White box. 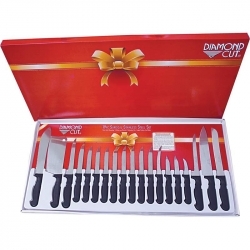 The Diamond Cut(R) 19pc Cutlery Set in a gorgeous White/Red Bow Box will be the kitchen set you'll turn to for every cutting task. This set can only be called phenomenal because these knives never need sharpening. 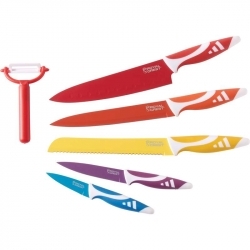 Features surgical stainless steel blades and easy grip polypropylene handles. 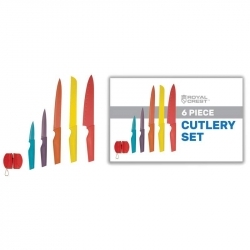 Cutlery set includes a butcher knife, cleaver, fillet knife, utility knife, tomato knife, boning knife, 12-1/2'chef's knife, ham/bread slicer, 3 paring knives, and 8 steak knives. Dishwasher safe. Limited lifetime warranty. $89.95 Open Stock Value. Gift box. An ergonomically designed, well-balanced knife featuring full-tang construction for heavy-duty durability. Blade is finished with satin polish that resists corrosion and pitting. Measures 15-1/2' overall, with a 9-1/8' blade. Limited lifetime warranty. White box. Slitzer Germany 6pc European style Steak Knife Set. 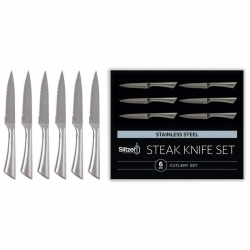 6 pc steak knife set. Material: 420 SS 1.2mm thickness shiny finish blade, 430 stainless steel handle with oval thumb rest. 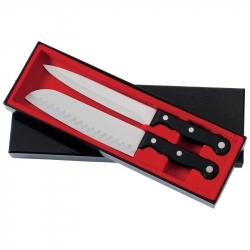 Contains one 8' Santoku knife and one 8' carving knife. Both knives feature phenolic handles, full tang and 3 genuine rivets. Limited lifetime warranty. Gift boxed. Each ergonomically designed, well-balanced knife features full-tang construction for heavy-duty durability. Blades are finished with satin polish that resists corrosion and pitting. Set includes: 5-1/4' poultry shears; 11' meat fork with 5-3/4' prongs; 7-3/4' utility knife; 10-3/8' carving knife; 9-1/8' cleaver; 12' meat slicer; 11-3/4' sharpener; 12-1/4' long knife great for pastries and other sectioning; 11-7/8' chef's knife; 9-1/4' fillet knife; 6-5/8' utility knife; 6-1/2' utility knife; 5-1/4' boning knife. Set includes 8pc small gadget set (decorating knife, lemon grater, decorating scoop, oyster knife, cheese knife, multi-use knife, potato peeler, and melon baller). All store in a special 23' x 15-1/2' x 4-3/4' aluminum case that can also double as a hard-sided briefcase. Limited lifetime warranty. $550.00 Open Stock Value. White box. 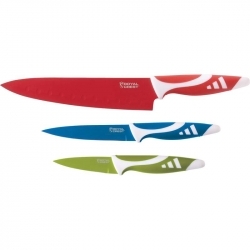 Includes 8' chef's knife, 5' utility knife and 3-1/2' paring knife. 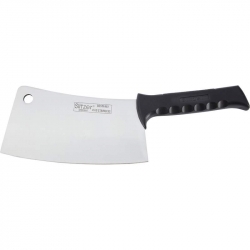 Features stainless steel blades and Leymar(TM) handles. Limited lifetime warranty. Gift boxed. 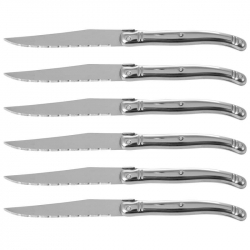 Slitzer 6pc Hollow Handle Stainless Steel Steak Knife Set. 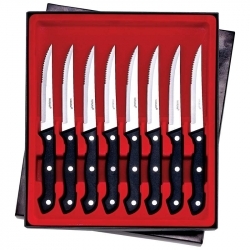 Set includes: 9.25' steak knives - fully serrated blades. Brushed finish. All blade material: 3CR13 stainless. Slitzer Germany 6pc European style Steak Knife Set with Wood Block. 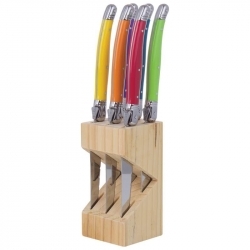 6 pc steak knife set - mixed color. Material: 420 SS 1.2mm thickness shiny finish blade, 430 SS hollow bolster with ABS mixed color handle with oval thumb rest. 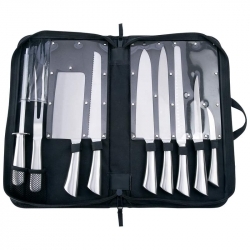 Includes 8' chef's knife and 8' carving knife. Features stainless steel blades and Leymar(TM) handles. Limited lifetime warranty. Gift boxed. Slitzer 5 pc Hollow Handle Stainless Steel Kitchen Cutlery Set. 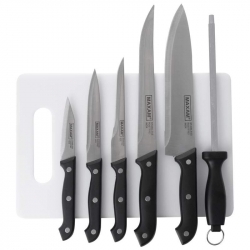 Set includes: 8' 2.5mm Santoku Style chef knife - honed, 8' 2mm carving knife - honed, 3' 2mm paring knife - honed, 5.5' 2mm boning knife - honed, 4.5' 2mm utility knife - serrated. All blade material: 3CR13 stainless. Royal Crest(TM) is one of the best culinary knife sets on the market, featuring professional quality stainless steel, non-stick color coding in modern designer hues, ergonomic Leymar(TM) handles designed to flawlessly fit the curve of your hand, and a magnetic closure storage box. Buy Royal Crest(TM) and discover the safety and precision of quality, professional grade kitchen knives. Colorful, non-stick coating will not tarnish or rust, and the non-stick coating makes clean up very easy. Ergonomic handles designed for ease of use whether you're right or left handed. 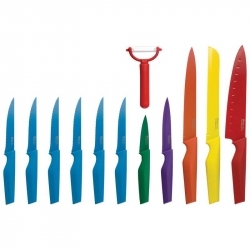 Different color knives prevent cross-contamination during cooking. The only set you need for home use, office use, or the professional kitchen. Buy a set for the RV or the camper. Great gift idea for the new bride or for Mom for Mother's Day! Royal Crest(TM) offers a limited lifetime warranty.